Ready to get the Guide? Click here for a quote. This Guide for End Users is an outstanding tool to help your users maximize their utilization of SharePoint and build exciting and useful functionality. Providing detailed examples, this guide will be the best resource for End Users to use in their pursuit of making SharePoint create real value in their organization. Get online tools and resources available for your people. This Guide for End Users is an outstanding tool to help your users maximize their utilization of SharePoint and build exciting and useful functionality. Providing detailed examples, this guide will be the best resource for end users to use in their pursuit of making SharePoint create real value in their organization. Unlike a traditional book which you have to set on everyone’s desk, the SharePoint Tutor 2010 is available for corporate licensing giving your users instant access to the best tips and “how-to” instructions to build exciting and useful functionality in SharePoint. Our SharePoint guide provides over 181 tasks available to any user at anytime they’re connected to your network. You don’t have to worry how to deliver tons of books to your users, or conduct countless hours of training classes — they don’t have to lug books around as they travel — and they don’t have to find space for them, and they don’t have to remember from a boring class. The resource is available on the spot with screen-cast video tutorials. Online Video Screencasts –When you purchase one of the above licenses you, are also able to purchase screencasts of the content in the book. If you or your users need to see how it works step-by-step in live video, these screen casts are perfect. They walk you through the same step-by-step process as in the book but do it as a screen cast. Each screencast is only a few minutes. In total there is over 4 hours of screen casts. The video file formats are flexible and will be delivered to you in a format that you can play on the machines in your organization. Non-Printable PDF – The most cost effective option for those on a tight budget. Printable PDF – If you’re just looking for a way for your users to get the content in the book and you’re not concerned with searchability of the content and you don’t need to modify it, this option gets you a single PDF file with all of the content from the book — including full color screen shots. Word Files – In addition to delivering the printable PDF version, this option allows you to modify the contents of the book for your internal use. You can add your own screen shots to make the book look and feel like it was designed specifically for your organization. Each of the 181 tasks in the book is delivered as an individual file allowing the search engine in SharePoint to help your users get help with the specific problem they’re having. 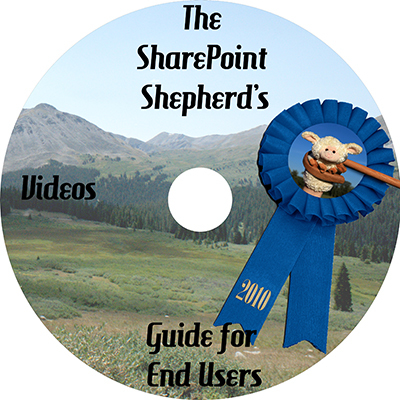 Wiki and SharePoint Help – If you want to make the book a living part of the conversation with your users — to allow them to comment on what they’re struggling with, to add their own tips, and to suggest or write new content, then you need the Wiki edition of The SharePoint Shepherd’s Guide for End Users. In addition to the word files, and the printable PDF, you get a site collection backup of the content in a Wiki. Included in this version is a deployment for the SharePoint help system so that you can deploy the Shepherd’s Guide into the SharePoint help system. How Do I Manage Versions? How Do I Get Notified of Changes?